You might have noticed customized message at the bottom of received emails. While some include name and address details, other might also include quotes with link to specific website. 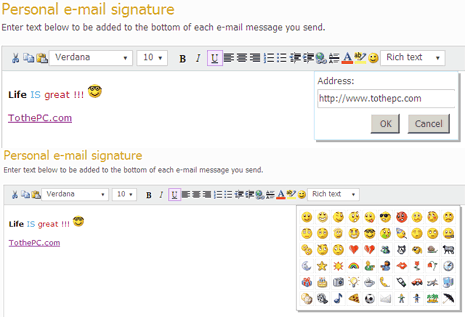 This is called email signatureand add it easily on Windows Live Hotmail. After adding email signature, all outgoing or sent emails will contain your customized email signature text at the bottom of each email message. 1. 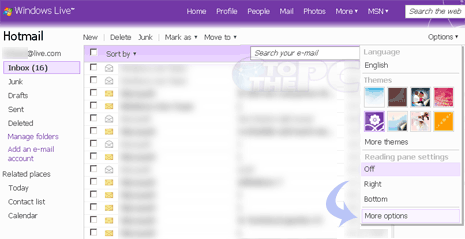 Goto http://mail.live.com and login into your Windows Live Hotmail email account. 2. Open inbox and click Options (at top right) & then click More Options (at the bottom of pop-up menu). 3. Click ‘Personal e-mail signature’ option under ‘Customize your mail’ option. 4. Type the signature message & click Save. This signature will appear on all future outgoing emails from your Live Hotmail email account. You can customize and format the text of your email signature in Live Hotmail. You can change text type, font and color as per choice. You can also add link to your official blog or website at the bottom by using hyperlink option. Just select the text that you can link and click hyperlinks option to enter target domain url of your blog or website. There is cool list of emoticons that can be added for extra zing to email signature on emails being sent from your Live Hotmail account. Play around with options for spicy looking email signature!